BOSTON, May 5, 2016—State Representative Christine Barber of Somerville and State Representative Paul Brodeur of Melrose will visit Housing Court at the Brooke Courthouse in Boston at 9am on Thursday, May 12, 2016. Barbara Zimbel, a civil legal aid attorney from Greater Boston Legal Services, will give the lawmakers a tour of Housing Court, which has jurisdiction over civil and criminal actions relating to the health, safety, or welfare of the occupants or owners of residential housing. They will be joined by Massachusetts Bar Association President Robert W. Harnais and Equal Justice Coalition Chair John Carroll. Earlier this year, the Equal Justice Coalition released a video about the need for civil legal aid in Housing Court. It can be viewed here. The Equal Justice Coalition, a collaboration of the Boston Bar Association, Massachusetts Bar Association and the Massachusetts Legal Assistance Corporation (MLAC), works to increase the state appropriation for civil legal aid through MLAC (line item 0321-1600). BOSTON, March 11, 2016—Honoring lawmakers and legal professionals for supporting civil legal aid, the Equal Justice Coalition and the Massachusetts Legal Assistance Corporation (MLAC) will host the Beacon of Justice Awards ceremony and a reception at the State House on Thursday, March 23 at 6 p.m.
State Sens. Harriette Chandler and Karen Spilka, and state Reps. Claire Cronin, Paul Donato, and Bradford Hill will be presented with Beacon of Justice Awards for their outstanding support of increasing state funding for civil legal aid through MLAC. MLAC distributes funds to civil legal aid organizations that assist low-income individuals and families in resolving issues related to basic necessities such as housing, employment, classroom accommodations for children with disabilities, and conflicts related to child support and custody, divorce, and domestic violence. Supreme Judicial Court Justice Robert Cordy and Attorney General Maura Healey will be honored with Champion of Justice Awards for their exceptional support for civil legal aid during their legal careers. A report released by the Statewide Task Force to Expand Civil Legal Aid in the fall of 2014 revealed that more than 60 percent of those eligible for civil legal aid in Massachusetts who seek services are turned away due to lack of resources. The Task Force recommended increasing the Commonwealth’s investment in civil legal aid by $10 million a year over the next three years to begin to address this unmet need. Based on the report’s recommendation, the Equal Justice Coalition and its legislative and legal allies have called for a $10 million increase in this year’s budget. The Equal Justice Coalition is a collaboration of the Massachusetts Legal Assistance Corporation, Massachusetts Bar Association and Boston Bar Association. It advocates increasing the state appropriation for civil legal aid, which funds programs throughout the state that provide legal advice and representation to low-income Massachusetts residents facing civil legal problems. For more information, visit https://equaljusticecoalition.org. The Massachusetts Legal Assistance Corporation (MLAC) was established by the legislature in 1983 to ensure that low-income people with critical, non-criminal legal problems have access to legal information, advice and representation. MLAC is the largest source of funding for civil legal aid in the Commonwealth. For more information, visit www.mlac.org. February 23, 2016—Demonstrating a broad base of support for increasing civil legal aid funding, managing partners of prominent law firms; corporate and university attorneys; deans of all Massachusetts law schools; and social services providers are calling for an increase of $10 million in the state’s investment in civil legal aid funding. Last month, Gov. Charlie Baker released a proposed FY2017 budget that allocated $17,170,000 for civil legal aid, an increase of $170,000 over FY2016. The request for a $10 million increase in civil legal aid funding is based on a recommendation by the Boston Bar Association’s Statewide Task Force to Expand Civil Legal Aid in Massachusetts, which in 2014 issued Investing in Justice, a report that demonstrated civil legal aid is unavailable to more than 60 percent of qualified residents who seek it. The report called for an additional state investment of $30 million in civil legal aid in Massachusetts, to be phased in over a three-year period. Managing partners from 44 law firms sent a letter to Gov. Baker on Jan. 15 urging him to consider the stakes of not providing legal assistance to low-income residents with critical civil legal issues. Signers included Robert I. Bodian of Mintz Levin; Adam P. Kahn and William R. Kolb of Foley Hoag; Deborah J. Manus of Nutter McClennen and Fish; and R. Newcomb Stillwell, of Ropes & Gray. In a separate letter, 69 attorneys who serve as general counsel at institutions ranging from Liberty Mutual Group, EMC Corporation, Arbella Insurance Group, Fenway Sports Group/Boston Red Sox, Boston Medical Center, Tufts Health Plan, Boston University, and Eastern Bank, emphasized that civil legal aid is the right investment to make when budgets tighten. Seventy social services agencies across the state representing children, people with disabilities, survivors of domestic violence, people who are homeless, older adults, and immigrants and refugees have also endorsed a statement of support for increasing the budget. Signers include Rosie’s Place; Jane Doe, Inc.; Boston Center for Independent Living; the Children’s League of Massachusetts; Elder Services of the Merrimack Valley; Northampton Survival Center; South Shore Community Action Council; Springfield Partners for Community Action; and Worcester Community Action Council. Read the full text of the letters here. BOSTON (January 21, 2016)―Chief Justice Ralph Gants of the Supreme Judicial Court and Attorney General Maura Healey will join hundreds of private attorneys from more than 40 law firms at the Massachusetts State House on Thursday, Jan. 28 for the 17th Annual Walk to the Hill for Civil Legal Aid. Attendees of this annual lobby day, one of the largest held at the State House each year, will request a $10 million increase in state funding for programs that provide civil legal aid to low-income Massachusetts residents. Speakers at Walk to the Hill will include Chief Justice Gants, Attorney General Maura Healey, Boston Bar Association President Lisa Arrowood, and Massachusetts Bar Association President Bob Harnais. The program will also include the screening of a video demonstrating the need for civil legal assistance in Massachusetts, featuring interviews with court personnel and Massachusetts residents in need of civil legal aid. Due to lack of funding, civil legal aid programs in Massachusetts are forced to turn away more than 60 percent of those eligible for civil legal aid who seek services. In 2014, the Boston Bar Association’s Statewide Task Force to Expand Civil Legal Aid in Massachusetts recommended increasing the Commonwealth’s investment in civil legal aid by $30 million over the following three years to begin to address this unmet need. Following the speaking program and video screening, attorneys will visit their legislators and urge them to increase funding for MLAC, the largest funder of civil legal aid in Massachusetts, by $10 million in the FY17 state budget, for a total appropriation of $27 million. Walk to the Hill is sponsored by the Equal Justice Coalition, a collaboration of the Boston Bar Association, Massachusetts Bar Association and the Massachusetts Legal Assistance Corporation. The event is also co-sponsored by numerous county and specialty bar associations throughout Massachusetts. 11:30 a.m. to 12:00 p.m. NOTE: Members of the media are welcome to attend all or part of the speaking program. Please follow the Equal Justice Coalition on Twitter as well as the hashtags #IWalkForJustice and #WalktotheHill for the latest on Walk to the Hill 2016. BOSTON, December 18, 2015 – The Equal Justice Coalition, a coalition of bar associations and private attorneys committed to equal justice for all, recently launched a new website to support the coalition’s work to increase state funding for civil legal aid. The redesigned site, with crisp visuals and an easy to navigate layout, enables private attorneys, bar associations, and other advocates to quickly connect with the effort to expand access to the courts for low-income people with civil (non-criminal) cases. To mobilize support, the website features “Action Alerts,” allowing advocates to quickly plug in to the latest campaign news and contact their elected officials to voice support for civil legal aid. The site also showcases past and future events the Equal Justice Coalition holds in support of civil legal aid, from the annual Walk to the Hill lobby day to the Legislative Recognition Reception. 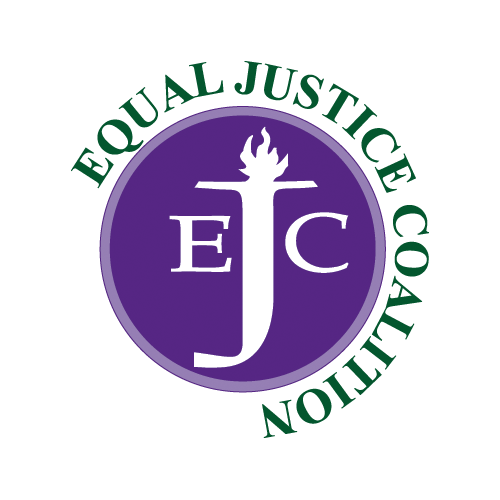 The Equal Justice Coalition hopes that the revamped website will bolster their continued efforts to increase state funding for civil legal aid. The Equal Justice Coalition, a collaboration of the Boston Bar Association, Massachusetts Bar Association and the Massachusetts Legal Assistance Corporation (MLAC), works to increase the state appropriation for MLAC’s line item (0321-1600). For more information, visit http://www.equaljusticecoalition.org.